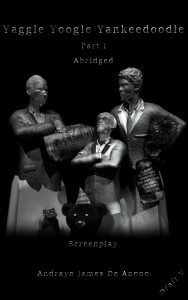 A Screenplay on the 2008/09 Financial Crisis! A Book of Its Kind! *Yaggle Yoogle Yankeedoodle Part I Abridged Draft V: Screenplay illustrated with picture set A by Andrayo James De Anono. Price is: Free in return for a Review. Genres are: Science Fiction Book of the Day, Sponsor, Business & Money, 2008 Financial Crisis. Support the author! Please leave a honest review on the book’s page on the store. See the YouTube video here. Author ReviewSaint - Free Books in Return for ReviewsPosted on December 1, 2018 Categories Free Science Fiction BookTags science fiction book in return for a reviewLeave a comment on Review Saint 44th Edition is Out! Get a Free Science Fiction Book in Return for a Honest Review! Free Science Fiction Book in Return for a Review! *Obsidian: Birth to Venus (The Obsidian Chronicles Book 1) by Marisa Victus. Price: Free. Genre: Science Fiction of the Day, Sponsor, Action & Adventure. Rated: 5 stars on 1 Reviews. 282 pages. ASIN: B01N64GTFF. Please leave a honest review after reading this book! Author ReviewSaint - Free Books in Return for ReviewsPosted on October 19, 2018 October 23, 2018 Categories Free Science Fiction Book, Free SciFi, Review SaintTags Free Kindle Science Fiction, Science FIction KindleLeave a comment on Planet Chimera: An Assassin Trapped in a Savage Planet – Get this Science Fiction Space Exploration Book free, Review after Reading! *Siphoners (Soul Burn Book 1) by Evan Bollinger. Price is: Free. Genres Are: Occult Horror Book of the Day, Sponsor. 382 pages. ASIN: B074FX35NK. Synopsis: Four strangers with the power to siphon human life suddenly find that power violent and volatile beyond their darkest dreams. Please leave your review on the Book’s Amazon Kindle page. Author KibetPosted on September 4, 2017 Categories UncategorizedLeave a comment on Get a Free Spine Chilling Horror Book in Return for Review! Get a Free Post-Apocalyptic Science Fiction Book in Return for a Review! Get a Free Post-Apocalyptic Science Fiction Book in Return for a Honest Review! *Clone City (Joypolis Book 1) by Adrian Peters. Price: Free. Genre: Post-Apocalyptic Science Fiction, Sponsor, Dystopian. Rated: 5 stars on 1 Reviews. 147 pages. ASIN: B071D2L6TS. Author KibetPosted on August 3, 2017 Categories UncategorizedLeave a comment on Get a Free Post-Apocalyptic Science Fiction Book in Return for a Review! Get a Free Science Fiction Book in Return for Reviews! These Books are Free in Return for an Honest Review. IF you like the book, please leave a review. *Spectrum (PDF for Downloads) by Martin Ott. Genres are: Science Fiction of the Day, Sponsor, Post Apocalyptic US After a Race War. Price is: Free in return for a Review. 241 pages. If you prefer, here is the Kindle Version. Author KibetPosted on June 20, 2017 Categories UncategorizedLeave a comment on Get a Free Science Fiction Book in Return for Reviews! ‘The Beast’, A Free Science Fiction Book in Return for Reviews. Review Saint Week 8! *The Beast (The Verge Book 1) by Alex Bobrov. Price: Free. Genre: Time Travel, Science Fiction, Adventure. Rated: 5 stars 0n 6 Reviews. 349 pages. ASIN: B01MT4OAXX. If possible, reviews can be left at Amazon Kindle Store & Nook Store. Author KibetPosted on April 24, 2017 April 28, 2017 Categories UncategorizedLeave a comment on ‘The Beast’, A Free Science Fiction Book in Return for Reviews. Review Saint Week 8! Review Saint Free Science Fiction – Get a Free Science Fiction Book in Return for a Review! *A Book Without Dragons – PDF by Olivia Berrier. Genre: Science Fiction of the Day, Fantasy. Rated: 4.6 stars on 23 Reviews. 245 pages. ASIN: B01F6HYV60. For Kindle and Mobi, here are the files: A Book Without Dragons – MOBI and A Book Without Dragons – EPUB. Please leave your reviews at Amazon Kindle Store if possible. Author KibetPosted on April 2, 2017 Categories UncategorizedLeave a comment on Review Saint Free Science Fiction – Get a Free Science Fiction Book in Return for a Review! Stem (Pollen Book 2) (pdf) by Aaron Lamb. Genre: Science Fiction, Dystopian, Adventure. 220 pages. ASIN: B01KJU76I4. Please leave your reviews at Amazon Kindle Store if possible.